On this day in 1906, Robert E. Newcomb and John Mueller were hanged together in Chicago, Illinois. Both were multiple murderers, with six deaths between them. 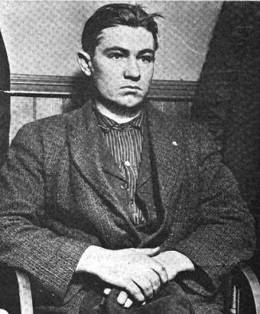 Newcomb, who was, described as “crazed” and “maddened,” hanged for the murder of Chicago police sergeant John Peter Shine. On October 10 the previous year, Shine heard reports of a gunman terrorizing people on the streets of Englewood. Newcomb had already shot three people and one, a woman named Florence Poore who was the wife of Newcomb’s friend, was dead. Shine found out the gunman had barricaded himself in his apartment. Although he was off duty, he decided to make the arrest himself. When he knocked on the apartment door and demanded entry, however, Newcomb simply fired through the closed door, hitting Shine in the abdomen and mortally wounding him. The officer died two hours later at Englewood Union Hospital, at the age of 42. Walter Blue, one of the others Newcomb had shot, also died of his wounds. After Shine was shot, over 100 police officers surrounded Newcomb’s apartment and fired into it, hoping to apprehend or kill the gunman. After a long siege, Newcomb surrendered to an equally certain death in the judiciary. Little is known about John Mueller or his crimes. Daniel Allen Hearn, in his book Legal Executions in Illinois, Indiana, Iowa, Kentucky and Missouri: A Comprehensive Registry, 1866-1965, describes Mueller as “a drunk and a loser who went berserk when refused money with which to buy liquor.” The 32-year-old slaughtered his wife, Annie, and their two daughters, two-year-old Martha and 18-month-old Mary, by shooting them and slashing them repeatedly with a razor. The two killers were executed in the Cook County Jail. It was an integrated execution: Newcomb was black and Mueller was white. 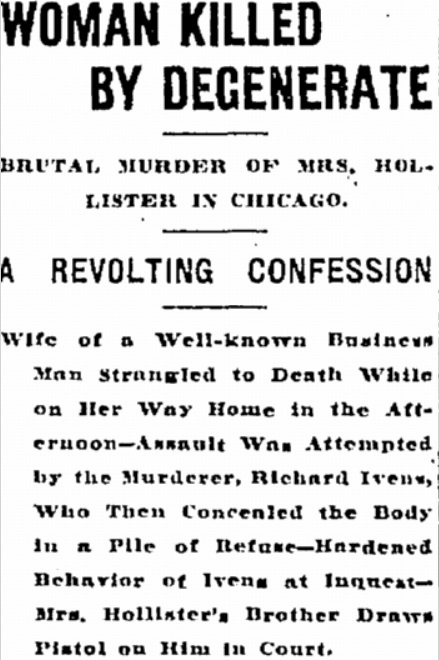 On this date in 1906, “with terror stamped on his colorless face and almost in a state of collapse,” Richard Ivens hanged for a murder that remains to this day an unsettling indictment of witness reliability — even when it is his own crime the witness describes. Baltimore American, Jan. 14, 1906. Usually, a confession is the “and shut” part of an open-and-shut case. Indeed, for most of human history, given a paucity of useful forensic evidence, legal cases have come down to eyewitnesses and confessions: hence the formalization of torture as part of the investigative process courts of bygone years. * A perpetrator’s own testimony against himself is the evidentiary gold standard. Today, this long-unquestioned bedrock of criminal justice is dissolving. A quarter or more of the wrongful-conviction exonerations from death row have been cases involving false confessions; witness testimony by victims or third parties has frequently been shown to be unreliable. Our behavioral models once implied that the brain stored memories like a faithful photograph, a view suggesting that witnesses could be either accurate or liars without much room in between. Today, it’s ever more widely understood that memories are constructed, and reconstructed, amid the interpolations of fragmentary data and the subtle feedback of others’ suggestion and influence. Perhaps this was just the gambit of a desperate defense counsel with few cards to play. But it did briefly make the Ivens case a referendum on the reliability of the confession. Ivens intimated that the circumstances of his interrogation might have intimidated him into confessing, but his subsequent claim to have no memory at all of those events led a defense “alienist”, J. Sanderson Christison, to argue that the whole story of the crime had been planted in his mind when he was in a hypnotic state. we find in the “confessions” a mixture of fact with “suggested” fiction … he was first forcefully charged with the crime in a brutal manner and after being confounded and subjugated, a current of leading questions were put to him on a stupid police hypothesis, so that the first “confession” is composed of a few vague and contradictory statements. And it is both evident and acknowledged that all the other official “confessions” are the products of question suggestions, almost entirely. For Christison, Ivens was a dull and easily controlled personality; the doctor’s explication of “hypnosis” suggests to modern eyes a laughably Mephistophelean sleepy, verrrry sleeeeepy caricature. But maybe we would do better to view it as the best framework available in 1906 to grasp the incomprehensible circumstance of a person accusing himself of a crime: the most ready illustration of outside influences entering the mind. A century later, we are only just now developing an understanding of wrongful confessions that might be shared widely enough to speak with mutual understanding about disorientation, suggestibility, leading questions, confirmation bias, and the malleability of memory. But by any name, the notion was not ridiculous to Christison’s peers. the accused was hanged; yet, if scientific conviction has the right to stand frankly for the truth, I have to say again that he was hanged for a crime of which he was no more guilty than you or I, and the only difference which the last few months have brought about is the fact that, as I have been informed on good authority, the most sober-minded people of Chicago to-day share this sad opinion. I felt sure from the first that no one was to be blamed. Court and jury had evidently done their best to find the facts and to weigh the evidence; they are not to be expected to be experts in the analysis of unusual mental states. The proof of the alibi seemed sufficient to some, but insufficient to others; most various facts allowed of different interpretation, but all hesitation had to be overcome by the one fundamental argument which excluded every doubt: there was a complete confesslon. And if the sensational press did not manifest a judicial temper, that seemed this time very excusable. The whole population had been at the highest nervous tension from the frequency of brutal murders in the streets of Chicago. Too often the human beast escaped justice: this time at last they had found the villain who confessed — he at least was not to escape the gallows. For many years no murder case had so deeply excited the whole city. 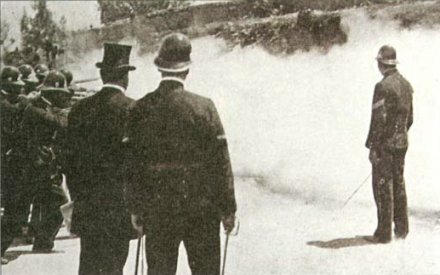 Truly, as long as a demand for further psychological inquiry appeared to the masses simply as “another way of possibly cheating justice” and as a method tending “towards emasculating court procedure and discouraging and disgusting every faithful officer of the law,” the newspapers were almost in duty bound to rush on in the tracks of popular prejudice. It is important that the court, instead of bringing out the guilty thought, shall not bring it “in” into an innocent consciousness. Of course in a criminal procedure there cannot be any better evidence than a confession, provided that it is reliable and well proved. If the accused acknowledges in express words the guilt in a criminal charge, the purpose of the procedure seems to have been reached; and yet at all times and in all nations experience has suggested a certain distrust of confessions. Lexington Herald, March 20, 1906. The Richard Ivens case, needless to say, is impossibly cold. It is quite difficult from several generations’ distance to form a convincing affirmative confidence in Ivens’s innocence. But as all those involved for good or ill have gone to their own graves too, perhaps it is enough for us to leave that door open just crack — enough to let in the humility before we print a man’s epitaph. 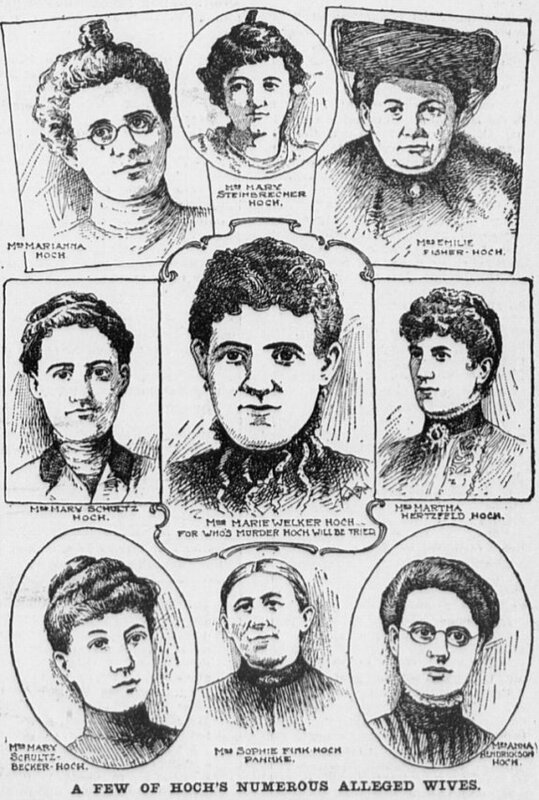 Wilkes-Barre Times, June 22, 1906. * Of relevance: a suspect tortured into a confession was usually required to repeat the confession free of torture in open court in order for it to count. Such people did sometimes refuse to do so and even blame the torture for having given a previous incriminating statement; the standard reward for such reticence was, naturally, more torture. ** Baltimore American, March 20, 1906. This is the Chicago Police Department we’re talking about. † Christison is also noted for theories about the shapes of the ears as criminal indicators, and the pamphlet explicitly cites Ivens’s phrenological characteristics as exculpatory. We all have our hits and our misses. BOGOTA, Colombia, Tuesday, March 6. — The three men who on Feb. 10 attempted to assassinate Gen. Reyes, the President of the Republic of Colombia, were shot to-day at the spot where the attack took place. Reyes had parlayed a successful military career into politics (Spanish link), and was the elected-ish but also dictatorial president of Colombia. He had the misfortune to ascend to this illustrious post on the heels of a bitter civil war that had seen its Panama department break clean away. To Reyes’ administration would fall a variety of civil society infrastructure projects (more Spanish): constitutional reform, military modernization, a central bank, reconciliation with the Liberal party. Marco Salgar (left) and Roberto Gonzalez, two of the failed assassins. He couldn’t make these omelets without breaking a few eggs and his authoritarian power was challenged with at least two coup attempts and multiple assassination plots, as well as a bid by other Colombian territories to break away and join up with Panama. 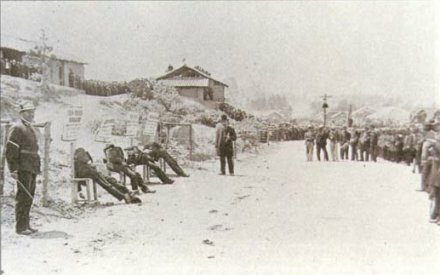 But the most notorious angry-with-Reyes event was the 10th of February 1906 — also the title (Spanish again) of a book of photographs documenting the incident — when three gunmen ambushed Reyes on the outskirts of Bogota and somehow all managed to miss both the president and his daughter. Reyes’ vengeance was extrajudicially old-school: the executions he arranged were not permitted under Colombian law at all, and by having them publicly shot at the scene of the crime, he added a downright medieval twist of lese-majeste. Images from here. These are the three shooters mentioned by the Times, as well as a fourth accomplice. However rough his methods, Reyes did accomplish some important reforms for his country, and he did have the grace to resign his position in 1909 under fire for financial and diplomatic mismangement. (The man’s five-year administration has its own periodization in Colombian historiography: the quinquenio.) There have been worse entries in the annals of dictatorship. On this date in 1906, still implausibly claiming his innocence, “Johann Otto Hoch” was hanged for the murder of his wife. Though Hoch died “merely” for that one homicide, he was suspected of numerous others in a prolific career of avaricious bigamy. “Marriage was purely a business proposition to me,” Hoch eventually admitted. Sometimes Hoch was content to vanish with the cash (with nice twists, like a hat left by a riverbank to suggest drowning). Other times, he went above and beyond the standard in the professional-bigamy industry and availed the expedient of loosing the matrimonial bonds (and the purses of life insurers) by graduating himself to widowhood. Precisely how many women he poisoned off with arsenic isn’t known exactly, but it’s thought to range into the double digits. And when he was on his game, he was known to churn through the ladies at breakneck speed. His last murder victim, and the one he hanged for, was Marie Walcker of Chicago … but as Marie lay dying of her husband’s expert ministrations, Johann, bold as brass, proposed to Marie’s sister Amelia. Those two “lovebirds” married a week later and within hours, the groom had disappeared, pocking $1,250. Call Amelia doltish if you will, but she went straight to the police. It turned out it was Hoch who recklessly set himself up for capture with this whirlwind double-dip courtship, and the very freshly buried evidence of his recent malignity was easily retrieved from his late ex’s stomach. When arrested in New York, Hoch had a hollow pen full of arsenic. Naturally, the marriage proposals poured in as Hoch awaited trial early in 1905. Hoch was actually within moments of hanging in July 1905 when his defense team finally managed to raise the last $500 necessary to lodge an appeal. That’s right: justice with a co-pay. The legislature had considered, but had not passed, a law giving every death-sentenced person the right to appeal to the Illinois Supreme Court, and in lieu of such a measure, an appellant had to pony up for the privilege. On this date in 1906, Adolph Weber hanged in California for “one of the most revolting [crimes] in the annals of criminal history”:* the slaughter of his entire family. On the night of Nov. 10, 1904, a fire at the Auburn mansion of Julius Weber, the onetime owner of the (still-extant) Auburn Alehouse, raised the town’s alarm. Firemen responding discovered four bodies within: Julius, his wife, and two of the couple’s three children. The coroner’s inquest soon determined that all four victims had met a violent death (three by shooting, one by beating) prior to the conflagration, and suspicion naturally fell on the one kid who survived and now stood to inherit the boodle. Meanwhile, the legislative branch got busy on a new 1905 Patricide Law to disinherit any homicide beer baron scions of the future. Since the previous statutes had not bothered to anticipate the present circumstance, Adolph Weber inherited all his purported victim’s money (after all, the other potential heirs were also now dead): he promptly blew through most of it on his legal expenses. The life and character of Adolph WEBER have come under more notice than those of perhaps any other California criminal, unless DURRANT was the exception. And he is more of an enigma than DURRANT. The latter was industrious in protesting his innocence, while WEBER has never deigned to aver his, except when the direst question of his guilt or innocence was put to him at the trial, and even then his answers were in monosylables. On this date* in 1906, tsarist Russia executed the naval officer who had made bold to style himself Commander of the rebellious Black Sea Fleet. During the unsuccessful 1905 Russian Revolution, our firebrand Pyotr Schmidt was lieutenant commander of a destroyer stationed at the Black Sea port of Sebastopol/Sevastopol. 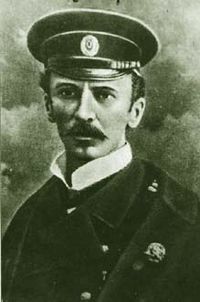 Schmidt made an impassioned revolutionary speech that got him arrested, and was in turn freed by protesting workers and soldiers. So they knew just the guy to call when a collection of Black Sea Fleet vessels finally out and mutinied. And Pyotr Schmidt knew how to talk the talk. The glorious Black Sea Fleet, sacredly devoted to the people, demands Your Majesty to immediately call a meeting of the Constituent Assembly, and no longer obeys orders of Your ministers. Commander of the Fleet P. Schmidt. Nicholas II decided he was better advised to just order the mutinying ships stormed, and Schmidt was taken prisoner. The most famous ship under Schmidt’s “command” was, of course, the battleship Potemkin, which trumps the cruiser Aurora as the revolutionariest hulk of floating steel in the Russian fleet by virtue of Sergei Eisenstein‘s silent cinematic celebration of the Sevastopol mutiny, The Battleship Potemkin. With this sort of insurrectionary credential, Schmidt was a popular choice for Soviet-era naming and renaming — streets, bridges, other naval vessels. 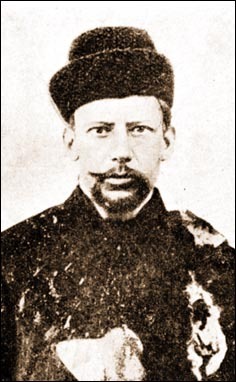 Schmidt thereby contributed his name to an entirely different innovation in the Russian language: in one Ostap Bender novel, there’s a “Children of Lieutenant Schmidt” network of con artists each claiming (in a different part of that vast country) to be the martyred mutineer’s progeny and mooching the material comforts due such an impressive lineage. So striking and popular was this portrayal that “children (or sons) of Lt. Schmidt” remains a going Russian idiom for anyone running a similar scam. * March 19 was the Gregorian date; it was March 6 by the obsolete Julian calendar still hanging on in Russia at this time. On this date* in 1906, Ivan Kalyayev (also transliterated Kaliayev, or Kaliaev) was hanged by his own assent for assassinating Grand Duke Sergei Alexandrovich in Moscow. The Warsaw-born Kalyayev tread the usual path of student radicals — expulsion, arrest, internal exile — into the camp of the Socialist-Revolutionary Party and the trendy propaganda-of-the-deed philosophy. He was the very epitome there of what Chaliand and Blin call “the moralistic approach to terrorism”; he would slay, of course, from a profound sense of moral outrage, but contextualized that terrible act with a no less dramatic sense of personal moral responsibility. loved the revolution with the tender, profound love felt for it only by those who have made it an offering of the whole of their lives. In this behavior, Kalyayev presents the fascinating specter of a terrorist whose certainty of the justice of his crime does not excuse himself from moral responsibility for the crime. I am happy to know I acted in obedience to the call of my duty … It would be ridiculous to think of saving my life now, when my end makes me so happy. I refused to sign the petition for pardon, and you know why. It was not because I have spent all my physical and mental powers; on the contrary, I have preserved all that life gave me for my last triumph in death … I could not accept pardon because it is against my convictions. This striking attitude recommended him to Camus, who featured it in Les Justes (The Just Assassins), a 1949 play exploring the morality of terrorism. That’s what love is — giving everything, sacrificing everything, without any hope of it being returned. This was not the only ethos competing for purchase on the story and the soul of Ivan Kalyayev. The Russian paper Novaya Gazeta published a fairly lengthy Russian-language biography of Kalyayev on the centennial of his entry into the executioner’s annals. * May 23 was the Gregorian date of the execution; it was May 10 by the Julian calendar still in use in Russia at the time. ** Cited in The History of Terrorism: From Antiquity to Al Qaeda. † With the requisite grandstanding, of course — a moral indictment given added depth by Kalyayev’s personal conduct. We are separated by mountains of corpses, by hundreds of thousands of broken lives, by an ocean of tears and blood that is flooding the entire country in a torrent of outrage and horror. You have declared war on the people. We have taken up the challenge … You are prepared to say that there are two moralities, one for mere mortals, stating, “Thou shalt not kill; thou shalt not steal,” and another, political, morality for the rulers, for whom it permits everything. On this date in 1906, Minnesota hanged a Cornish immigrant for the murder of his homosexual lover … and hanged him so clumsily that it never hanged again. 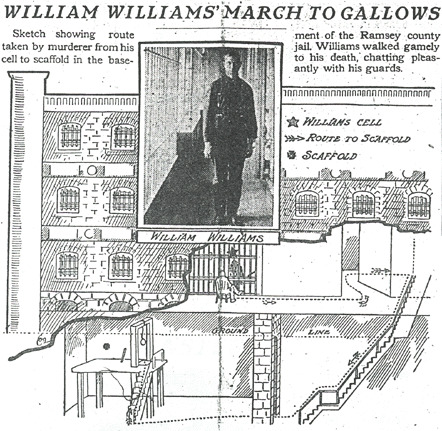 William Williams shot Johnny Keller dead after Keller’s mother intervened in the teenagers’ relationship. A series of mooning-slash-menacing letters failed to win back affections. “I want you to believe that I love you now as much as I ever did,” Williams wrote. “Keep your promise to me this time, old boy, as it is your last chance,” he wrote, later. Consequently, three deputies on the scaffold hoisted the rope up to get him airborne, where he strangled to death over the span of a ghastly quarter-hour. The surgeon, watch in hand, held his fingers on Williams’ pulse as he scanned the dial of his watch. There was a slight rustle, low murmurs among the spectators and then silence. Another five minutes dragged by. Would this man never die? Fainter and fainter grew the pulsations of the doomed heart as it labored to maintain its function. The dead man’s suspended body moved with a gentle swaying. The deputies wiped their perspiring brows with their handkerchiefs. Members of the crowd shifted from one foot to another. There were few murmurs, which died at once. The heart was beating now with spasmodic movement, fainter and fainter. Fourteen minutes—only a surgeon’s fingers could detect the flow of blood now. Fourteen and a half minutes. ‘He is dead,’ said Surgeon Moore. And the end had come. Two things happened in consequence of this sensational press narrative. First: the news entities who promulgated these descriptions were themselves prosecuted under a law sponsored by anti-death penalty Republican legislator John Day Smith to make executions as secretive as possible. The St. Paul Pioneer Press, St. Paul Dispatch and St. Paul Daily News each caught fines of 25 bones or clams or whatever you call them. 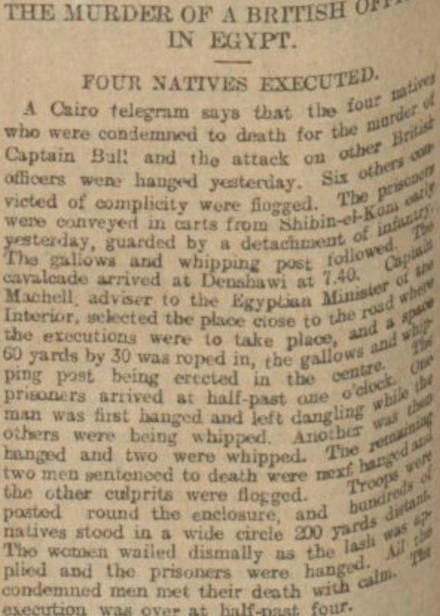 Second: those illicit descriptions out in the public eye triggered efforts (eventually successful in 1911) to abolish the death penalty full stop in the Land of 10,000 Lakes. There’s a great roundup of the Williams case here, and a pdf from the Minnesota Historical Society about the background and consequences of the John Day Smith law, themselves quite topical for this blog. 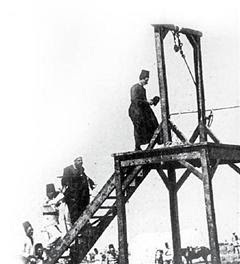 Smith’s law was adopted as a half-measure when death penalty abolition couldn’t pass in 1889, as a bit of moral hygiene against the unseemly spectacle of public execution. The measure pioneered the familiar 20th century routine of conducting executions after midnight behind prison walls. Newspapermen derisively called it the “midnight assassination” law — but it was taken up by many other states over the succeeding years as public executions went extinct. As for Smith himself … there’s a rumor of a ghost story, and (given a tragic love story, a sensational crime, a capital punishment milestone, and a queer identity) the palpable fact of a play. 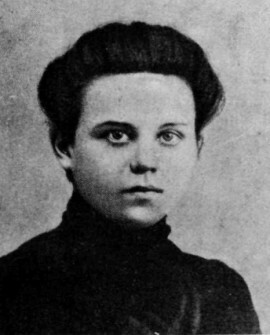 On this date in 1906, less than three weeks after she had assassinated tsarist general Georgiy Alexandrovich Min (Russian biography), revolutionary Zinaida Vasilevna Konoplyannikov was hanged at Schlisselburg fortress near St. Petersburg. Konoplyannikov is mostly noted in Russian sources online (for instance, here and here). The daughter of a soldier and a peasant, she was educated — hardly a given for a low-born girl in the late 19th century — and taught in the Baltics and St. Petersburg around the turn of the century. By her profession, the plight of her similarly unprivileged students helped radicalize her. She had a couple arrests for the usual subversive stuff (distributing illicit propaganda and the like) during Russia’s brief flowering towards liberalism in the 20th century’s early years. Those years would be bloodily reversed as tsarism reasserted itself after the revolutionary moment of 1905. Konoplyannikov avenged herself on one of the great villains (from her standpoint) of that reversal, G.A. Min — commander of the Semenyovsky Life Guards regiment which bloodily bombarded Moscow’s Red Presnia working-class district to crush the last bastion of revolutionary sentiment in December 1905 at the cost of more than 1,000 lives. Konoplyannikov gunned him down at a Peterhof train station the following August; in a closed military courtroom (giving her no opportunity to use the trial as an oratorical platform), the assassin was condemned to hang in less than an hour. No repressions, no arrests, no prisons, no exiles, no shootings, no punitive expeditions, no pogroms, will stop the rising national movement. I die with one thought: forgive me, forgive me, my people! I have so little to give you — only this, my life. I die full of faith in what will come … when the throne will crumble, and over the Russian plain, a broad, bright sun of freedom arise. According to Abraham Ascher, Min’s assassination so spooked Tsar Nicholas II that for a time he refused to leave his room … a evocative and emblematic summary of the Romanov dynasty’s ultimately fatal dilemma.